Children’s Hospital of the King’s Daughters will present a free, six-week class this summer for families of children with special needs. Michelle Tryon, a certified child life specialist, will teach “Parenting a Child with Special Needs,” a six-week class series that offers families support and skills they will need when a child is diagnosed with a chronic, life-altering or life-threatening health or behavior challenge. Families will learn to create nurturing homes and healthcare routines. The class will be held Wednesdays, June 17-July 22, from 7-8:30 p.m. at the CHKD Health & Surgery Center at Princess Anne, 2021 Concert Drive, Virginia Beach. You can register for the class here or call (757) 668-7500 or (800) 395-2453. The class is part of the Family Forum free lecture series on children’s health and wellness presented by Children’s Hospital of the King’s Daughters and Kohl’s Cares for Kids. It was a busy weekend at St. Mary’s Home for Disabled Children. On Saturday, CEO William C. Giermak led the ninth Family Forum, which was followed by a tropical-themed Family Night program put on by the Recreational Therapy Department. 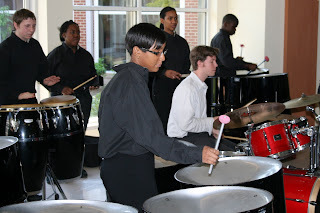 On Sunday afternoon, our Atrium was filled with the joyous sounds of steel drum music. The Rhythm Project All Stars performed a free public concert sponsored by Claire and David Benjack and the Auxiliary Board of St. Mary’s Home for Disabled Children. The group is the premier performing ensemble of The Rhythm Project world percussion and dance ensemble founded by The Virginia Arts Festival. School may be out this week for spring break, but the Girl Scouts of Troop #5067 at St. Mary’s Home for Disabled Children had some paperwork to do today. The Scouts gathered in our Atrium to make cards, stamping and gluing and picking out paper in pretty colors. They created beautiful thank-you cards for SMHDC staff to mail to supporters. In this photo, 17-year-old Ashley works on a card with a bit of help from Kathryn Simmons, an intern in the Recreational Therapy Department. Would you like a unique thank-you card created by one of St. Mary’s Girl Scouts? Leave a comment on the blog by midnight (Eastern time) on April 19. One lucky commenter’s name will be drawn at random to receive a card. Open Up and Say "Ahhhhhhhh"
“Do you want watermelon?” Jennie Jones asked Jahmari as Amber Nester gently stroked his hand. Jones then used a tiny brush to paint a watermelon-flavored flouride varnish on Jahmari’s teeth. Nester and Jones, pictured at left giving Jahmari’s teeth a good brushing during his check-up, were among 37 senior dental hygiene students from Old Dominion University who spent today at St. Mary’s Home for Disabled Children providing clinical services to children and young adults who live here. 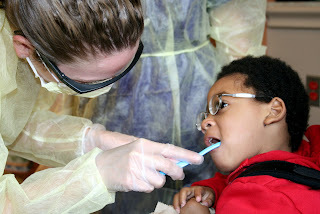 While St. Mary’s residents are regularly seen by a dentist who comes to the Home, the annual ODU clinic is a way for students in Carleen Lynch’s community oral health class to get practical experience. “This provides them the opportunity to have contact with a population they normally don’t often see in private practice,” said Lynch, an assistant professor at ODU’s School of Dental Hygiene. Dr. Cordell Johns, a dentist and ODU faculty member who accompanied the students to the Home, said he hopes the field trip also inspires students to come back as volunteers. 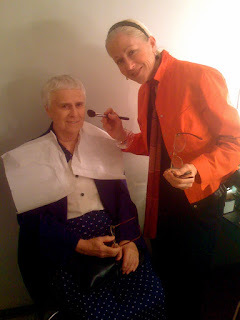 “The staff here are absolutely fabulous,” Johns added. “They have a lot of love” for the children. Sister Mary June Morin has been featured in The Virginian-Pilot and in her hometown paper in Madawaska, Maine. Now, she’s headed to television.